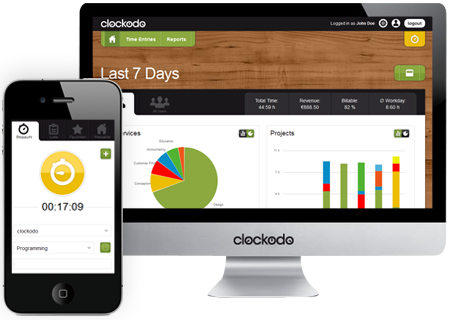 Clockodo is a time tracking solution by which businesses and freelancers can keep a track of their project and services. A dashboard can be accessed by users which display current work progress, total tracked time and billable time. It also provides budgeting solutions to users. The user can view and even print the timesheets information with five different time options as a pie chart or bar graph provided by the diagram option. A track on the projects can be kept as how much time it may require. Time entries can be grouped by day or task. Options are available to give specific permissions to specific users, for instance, a team member can view only his personal hours in the timesheet. Clockodo also provides additional features such as overview calendars and a desktop and smart phone app. What is the history and popularity of the app? Clockodo was designed to give business and individuals to monitor their task durations and it made its position in the market due to its friendly user interface and simple design. It might have been jingled a few times due to lack of innovation but it is still the best for people who wants job done easily. Clockdo offers many features including a number of features for time tracking. The user can view report data helping them in improving the time they spend on a project. Clockodo includes desktop and mobile versions, which will give it a leg up on less flexible competitors. Clockodo has a very neat design and a beautiful easy to navigate interface. Users can easily switch to Clockodo from various applications. The user friendly and soothing interface gives it a more professional look. Registration has two options “try it for Free” or “Free Trial”. The user will then be prompted to fill his mandatory details first name, last name, company name and enjoy the free trial with his new account. The free trial version of Clockodo can be used for 30 days and then the user is notified to purchase it. Clockodo can be bought for a monthly $8 subscription and can enjoy all its basic features. Each employee can then be added at $5 per month and users will be charged only for active employees during that month. Clockodo is advisable for small businesses, startups and freelancers. It helps a lot in the billing of employees and the subscription fee adjusted according to employee’s activity. This allows the user to keep former employees on their account so the data remains in reports.